The judge criticized both the prosecution and the FBI for not providing evidence to the defense as required under court rules. “The court finds that the universal sense of justice has been violated,” Navarro said. She said the prosecution’s reliance on the FBI and failure to look beyond the documents the FBI provided represented an “intentional abdication of its responsibility.” Essentially, she said the prosecution decided not to follow up because the evidence would have worked in the Bundys’ favor. Navarro’s decision comes less than a month after she declared a mistrial in the caseand found federal prosecutors willfully withheld critical and “potentially exculpatory” evidence from the defense. Cliven Bundy, his sons Ammon and Ryan Bundy, and militia member Ryan Payne were all in court. 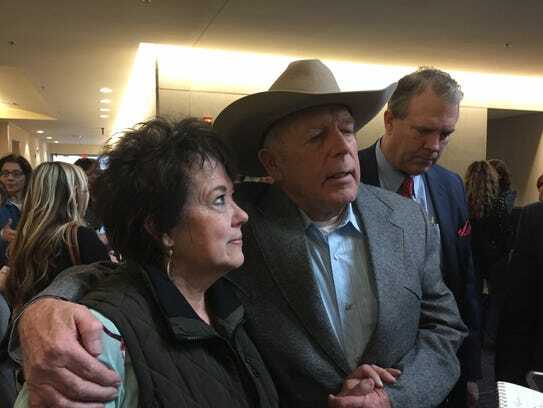 Cliven Bundy had remained in jail until the hearing; the judge ordered his immediate release and he walked out of the courthouse shortly after. Former Acting Nevada U.S. Attorney Steven Myhre, who led the prosecution, had urged the judge in a Dec. 29 motion to allow his office to retry the case. Prosecutors said Bundy conspired with militia groups and anti-government protesters to block a lawful roundup of his cattle from public lands. He said defendants had wrongly tried to turn the case into a civil-rights issue and improperly tried to allege they acted in self-defense. The motion was the first time Myhre publicly addressed the judge’s findings about suppressed evidence. “The government’s belated disclosure of these materials is not so grossly shocking or outrageous as to violate the universal sense of justice,” he wrote. He said prosecutors genuinely did not believe they had to turn over evidence based on previous court rulings. He also said some documents were accidentally overlooked among the hundreds of thousands of pages prosecutors turned over to defense lawyers. Defense lawyers had sought to have the case dismissed and their clients freed from the chance of being tried again. They said recently revealed documents provided critical evidence that would have allowed them to challenge the government’s charges, impeach government witnesses and lay the foundation for self-defense claims. They said a retrial would have given the government an unfair advantage, allowing them to build arguments based on defense strategies that were laid out in the first trial. Navarro delayed the trial before the jury was seated to hear opening statements in November. She suspended the trial again in December and warned of a potential mistrial after prosecutors for the first time disclosed several documents that appeared to support defense claims about the government’s use of video surveillance and sniper teams during the standoff. Navarro said last month that it didn’t matter if the failure to disclose was intentional or inadvertent. But she detailed several instances where prosecutors denied evidence existed and used hyperbole to mock defense requests for information. But documents later showed an internal investigation had taken place, and had found misconduct. Navarro pointed out that during two previous trials of militia members who supported Bundy, prosecutors insisted there was no evidence that video surveillance and sniper teams were in use around the Bundy Ranch prior to the the standoff. Navarro said assessments written by federal agents that dismissed the Bundys as a threat as early as 2012 were not turned over to the defense. Navarro said these reports could have been used to challenge prosecution claims. Navarro said since the Oct. 1 discovery deadline, when prosecutors were required to turn over all material evidence to the defense, the prosecutors turned over 3,300 pages of additional documents. She said much of that has occurred since the start of trial. Navarro’s ruling for a mistrial did not take into account another document turned over to the defense in December and leaked on pro-Bundy websites that raises more criticism of the BLM’s conduct and use of force during the standoff. In an 18-page memo, Special Agent Larry Wooten said he “routinely observed … a widespread pattern of bad judgment, lack of discipline, incredible bias, unprofessionalism and misconduct” among agents involved in the 2014 standoff. He said his investigation indicated federal agents used excessive force and committed civil-rights and policy violations. The Bundy Ranch standoff became one of the most high-profile land-use cases in modern Western history. It pitted cattle ranchers, anti-government protesters and militia members against the Bureau of Land Management. 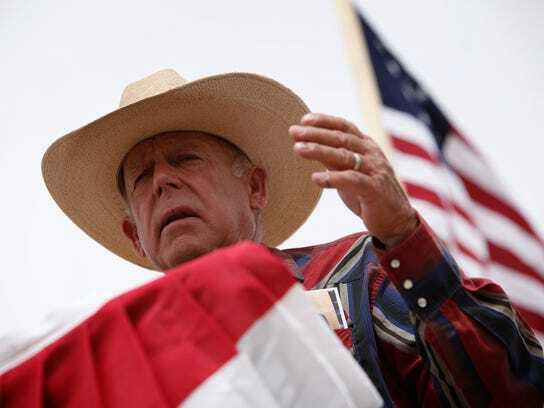 For decades, the Bureau of Land Management ordered Cliven Bundy to remove his cattle from federal lands, and in 2014 the agency obtained a court order to seize his cattle as payment for more than $1 million in unpaid grazing fees. The Bundys launched a social-media rallying cry. Hundreds of supporters, including members of several militia groups, converged on the Bundys’ ranch. For many Americans, images of the four-day standoff in a dusty wash below Interstate 15 northeast of Las Vegas were shocking. Protesters, ranchers and militia members took armed positions around federal law-enforcement officers, some lying prone on freeway overpasses and sighting down long rifles. Federal agents abandoned the roundup, saying they were outgunned and in fear for their lives. The standoff was hailed as a victory by militia members. Ammon and Ryan Bundy later cited their success at Bundy Ranch in the run-up to another protest of BLM policies, the siege of an Oregon wildlife refuge in 2016. An Oregon federal jury acquitted Ammon and Ryan Bundy and five others in October 2016. The government in 2016 charged 19 people for their roles in the standoff. Myhre and his team described the Bundys and supporters as vigilantes, willing to risk a gunbattle in defiance of lawful court orders. The Bundys, Payne and other defendants were charged with 15 felonies, including conspiracy, obstruction of justice, extortion, using firearms in the commission of crimes, assault and threatening federal officers. After the initial charges, two of the 19 men took plea deals. Trials for the remaining 17 defendants were broken into three tiers based on their alleged levels of culpability. Four more defendants have since taken plea deals. But making a solid case against Bundy and his supporters has eluded prosecutors. Two federal juries in Las Vegas have rejected conspiracy claims against six defendants in earlier trials. Ryan Bundy, who served as his own lawyer, asked Navarro if the government’s misconduct would result in overturning the convictions of Burleson and Engel. Navarro said those issues would need to be addressed separately.